Clan and kinship—the idea of working together and sharing in a task, of being part of a whole—are tightly woven into Navajo tradition. Which makes it fitting that working together has brought the beef cattle produced by members of the Navajo Nation from a deeply discounted commodity product to a premium product with massive future upside marketing potential. Native American Beef (NAB) is a premium branded beef program featuring grass-fed grain-finished, source-verified beef produced by Native American ranchers from Arizona and New Mexico. Cattle once sold a few at a time by individual ranchers are now uniformly managed and marketed together into the specialized program with a preset end user. In 2017, 1,258 head were grouped from more than 80 Native American ranching families from four tribes. Those cattle then march down a carefully paved path designed to maximize their potential. Gene Shepherd brands a calf at a Padres Mesa Ranch demonstration work day. The premium prices now paid for beef going into the branded beef program is providing a new vigor to a ranching community that has struggled to find their footing. In 1974, many Navajo people learned they would soon be uprooted from the central Arizona land they called home. Hopi and Navajo had long disputed who owned the lands, with the federal government eventually ruling in favor of the Hopi. Navajo families on the disputed land were relocated to the New Lands—a parcel of 360,000 acres purchased in the remote high desert around Sanders, Arizona. These families had rich traditions of raising sheep and cattle. 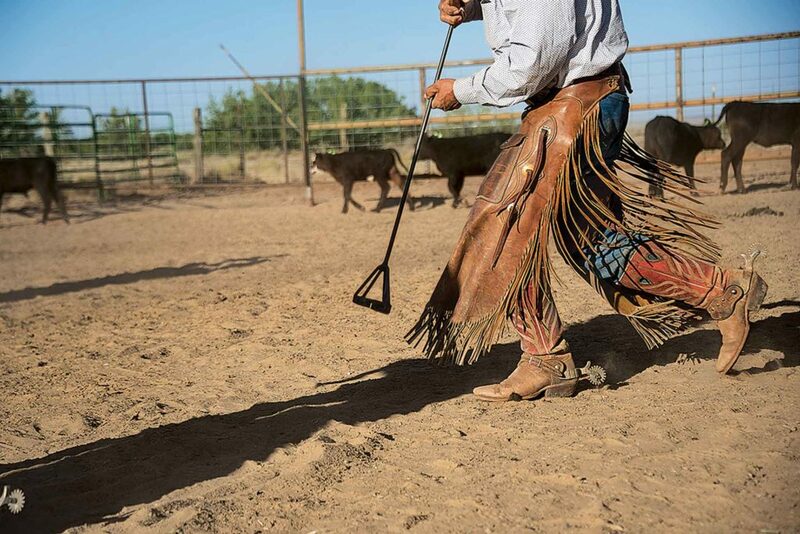 The Office of Navajo Hopi Indian Relocation (ONHIR) divided the land into 14 range units where they built housing, developed water and set up a state-of-the-art livestock working facility to help continue the livestock tradition. They developed range management plans to ensure forage availability in an extremely challenging region. This work provided a foundation for 80 families to continue raising livestock. Each permit-holding family is allowed 20 head of cattle. Many had to cut back substantial herds. “My grandparents were large livestock holders and farmers with herds more than 100 head. It was devastating when they were forced to move and reduce their herd,” says Kimberly Yazzie a Navajo Nation member and Labatt Food Service marketing specialist. Kimberly Yazzie saw an opportunity to help fellow Navajo ranchers by joining the Labatt team marketing Native American Beef. Livestock production continued, but markets proved problematic. 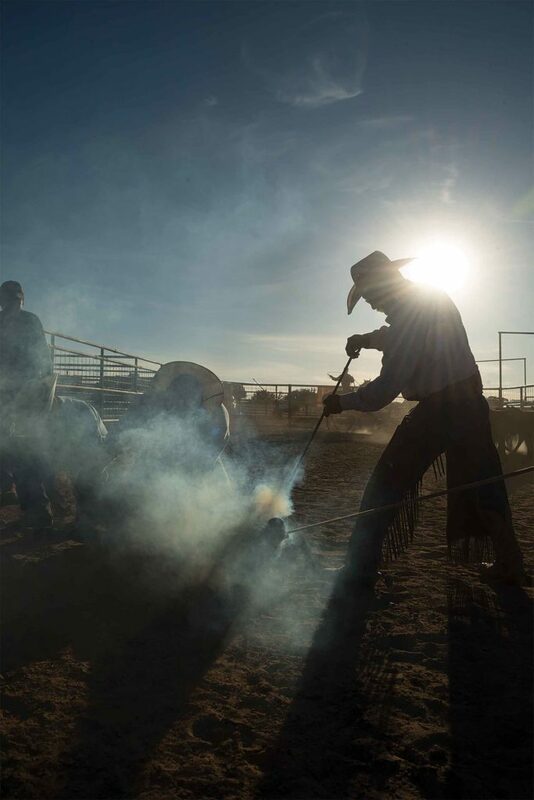 “At the sale barn, we would only get around $0.85 per pound, even in very recent years,” says Darrell Tso, rancher and commission president of the Nahata’ Dzill chapter of the Navajo Nation. The quality of the cattle had no bearing on what they brought. In 2009, ONHIR hired Bill Inman to manage the Padre Mesa Ranch. Sitting on 60,900 acres of the New Lands, its purpose is to determine best practices for managing land and livestock in the area and share that information with Navajo ranchers to help them be more competitive. The ranch also is expected to generate income and that meant finding better markets. Seeking profit. Area livestock production was faltering as abysmal markets encouraged cutting any expenses, even vaccination. Inman soon felt this pain as he stocked the ranch and tried to sell his first group of calves. “I found out the local sale barn only sold 100 head per week. I dang sure wasn’t going to take cattle there,” Inman says. He started building value in the Padres Mesa herd to open marketing options. He followed third-party vaccination protocols, purchased EID tags for source and age certification, and sold on video auction instead of locally. “I made $55,000 on the first load of heavies, which paid for half the cows,” Inman says. It also identified the local market, not the cattle, as the primary profit obstacle. Inman worked with Navajo permit holders to implement range management protocols, mineral and vaccination programs, and other beneficial practices. Padres Mesa started pooling cattle with producers following those protocols to offer larger lots for sale. Padres Mesa ranch served as the proving grounds for the programs and education events were—and continue to be—held regularly. Todd Foster helps sort off calves. The day is as much about learning as it is completing the task, with multiple people observing and rotating through the various jobs of the day. “When I was able to get above- average market prices, it really helped pick people up. One producer thought it would be a miracle if I could get him $1.37 for a 500-weight calf. When I got him $1.42, he flipped,” Inman says. Search for more profits led to contracts with processors for Navajo branded beef that was proving to be top quality. There were a few train wrecks, but eventually the right partner came along in family-run Labatt Food Service. Labatt was looking to gain valuable casino clients and saw Navajo Beef brand as a door opener. Inman encouraged producers to campaign to get their beef in their own casinos. They got their shot with a commitment to serve Navajo Beef at a grand opening. The event was a success and the branded beef, supplied by Labatt, was soon in all Navajo Nation Gaming Enterprise facilities. As demand grew, other tribes were invited in to fill orders, transitioning the brand to the more inclusive label of Native American Beef. NAB is now featured in area grocery stores, schools, and elite restaurants. Ranchers are feeding their people, and their culture.